We Use Seven steps to being in control from In Control (www.in-control.org.uk). The first thing to do is to find out if you can get money for your support – and how much. The second thing is to make a plan about how you’ll use the money to get the life you want. You can do the plan yourself, or you can get help. 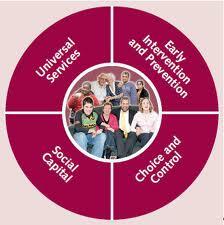 A social worker at the council has to approve your plan. When your social worker agrees your plan, you get your personal budget. You can get the money yourself as a direct payment, you can choose someone to look after the money for you or you can do a bit of both. You can organise your support in a way that suits you. You can get help to find and organise support. You can use services but you can also spend your money on people who you know – or even buy things that will help you in your life. You have to show that you have used the money properly. All work will be calculated on an individual basis depending on the individuals requirements. This will be calculated following a detailed brief to scope the necessary work, from which an estimate will be provided. Researching community services, work and training opportunities, travel options, etc. Providing individuals with details of local services and opportunities that can help them through any difficulties, help them develop skills, provide them with advice e.g. the benefits maze, job seeking, etc. Enabling individuals to develop a support plan that can achieve their day to day living needs, hopes and aspirations, etc. Helping the individual negotiate their requirements. Helping individuals by providing mediation opportunities e.g. between the individual and their support staff or work experience opportunities, etc. Providing training for the individual or their support staff or both. Training may include travel training, managing their Personal Budget, managing their staff, developing new skills, etc.